At Cassidy Bros. Forge, we’ve been designing, manufacturing and restoring fine wrought ironwork for over fifty years. We’re three brothers who started our company in 1965 because we have a passion for fine wrought ironwork – and the talent to forge an exceptional product. We’re proud of our reputation for fine craftsmanship and solid, enduring architectural ironwork. The emphasis of our products is on strength, longevity and artistic craftsmanship. After all, a hand forged wrought iron fence and gate is a permanent statement that’s built to stand for the century. It’s a legacy that will enhance the environment for years to come with the strength and beauty of fine wrought iron. Specializing in hand forged wrought iron fences and gates, we fabricate both traditional and contemporary styles of ironwork using the best of both modern and centuries-old techniques of fine craftsmanship. 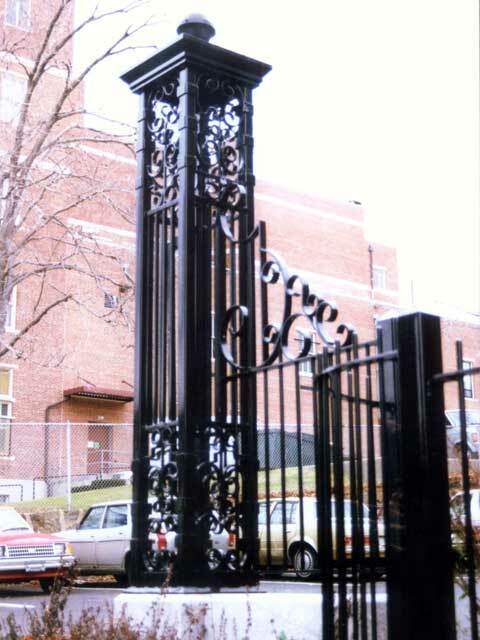 In addition to fabricating custom designs, we have a product line of standard wrought iron fencing and ironwork gates. Our collection of styles responds to the demand for a higher standard of quality in readily available designs made with solid pickets instead of from tubes. Our satisfied clients include numerous colleges, corporate headquarters, private estates, embassies, public parks, cemeteries, churches and cathedrals throughout the United States and abroad. We invite you to browse our project and portfolio listings. Call Cassidy Bros. Forge today at 1-978-948-7303 and see how our approach to the enduring beauty of wrought iron work will make a crucial difference in your next project.